You don’t have to be a gourmand to know that Guam food is pretty addictive. 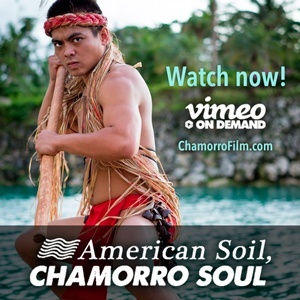 Search “Chamorro food” on Instagram and you’ll see just how much Chamorros miss home-cooked meals when they move off-island. 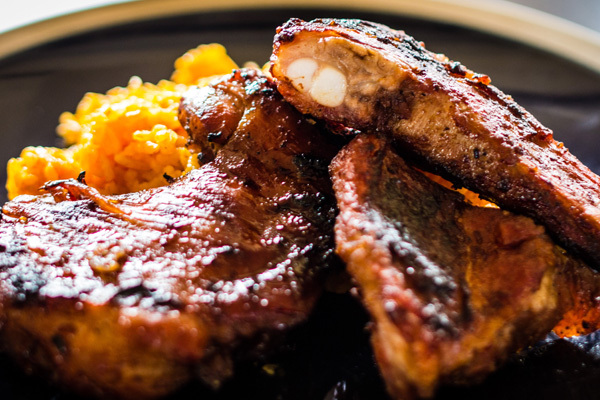 If you’re craving mom’s eskabeche or dad’s BBQ short ribs, heat up the skillet or fire up the grill and start cooking with these tried and true Chamorro recipes! 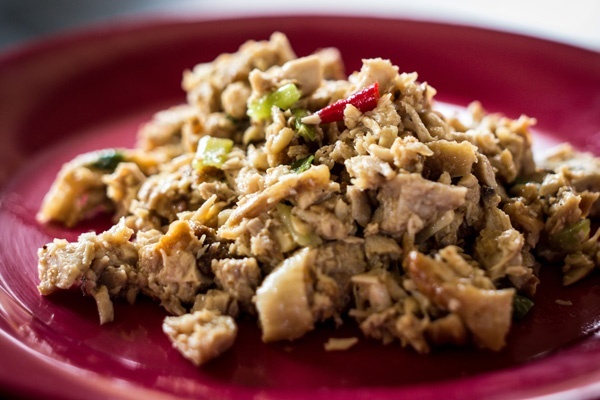 Don’t call it “chicken salad,” kelaguen is so much more. This spicy chicken dish is marinated in lemon and served with soft flour titiyas. 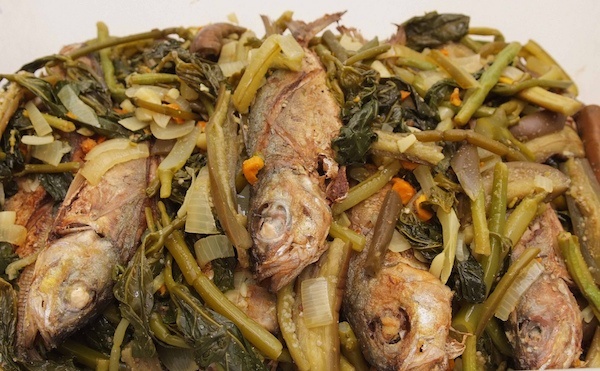 Variations on this dish are made with uhang (shrimp), guihan (fish) or binådu (deer). 4. Stir in the optional grated coconut. 5. Serve with my super easy sweet flour titiyas and enjoy! Fresh fish cooked in vinegar sauce, Chamorro eskabeche is an localized homage to the Spanish escabeche. 1. Clean and cook all vegetables, except green pepper and onions, in boiling water until tender. Reserve at least 2 cups of the cooking water. 2. Fry fish until barely cooked. Drain most of the oil from pan used to fry fish. Saute green pepper and onions in the same pan. Add grated or sliced fresh turmeric. (Powdered turmeric may be used if necessary.) Pour in about 2 cups of the vegetable water and about a cup of vinegar. Add salt to taste and bring to a boil. 3. Arrange cooked fish and vegetables in a large casserole dish or other serving dish. Spoon or pour solution over all. Refrigerated, this will keep for several days. 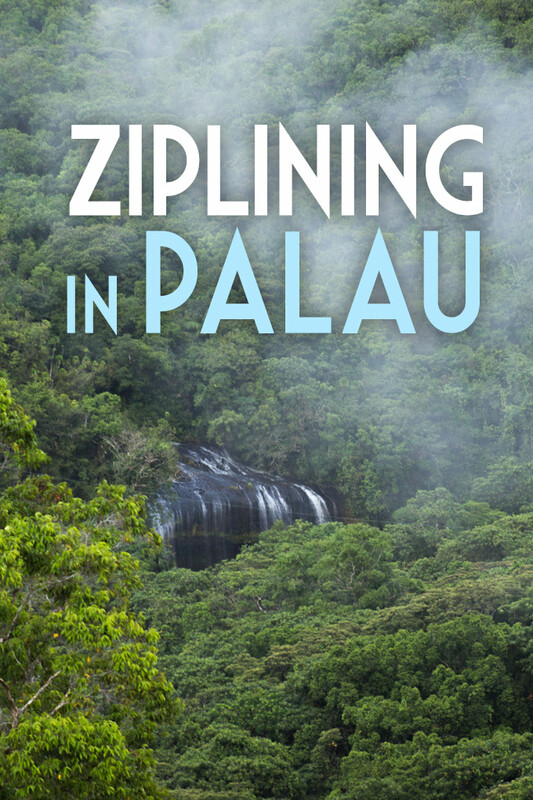 Every culture has its own all-purpose special sauce, for Guam it is Finadenne – a simple trifecta of salty, sour, and spicy. Enjoy with everything from BBQ to plain white rice. 1. In a small bowl, mix together the soy sauce and vinegar (or lemon juice if you prefer). 2. Slice the peppers then add them to the bowl with the onions, and tomatoes. Stir to combine. 3. Serve in a side dish or sprinkle over rice. 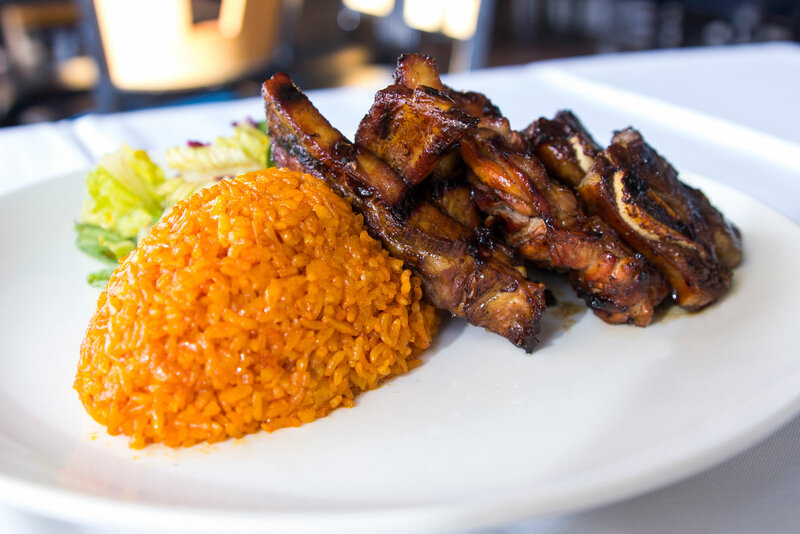 Guam BBQ is typically made with Korean kalbi style short ribs, over a charcoal grill. Each family keeps its own BBQ recipe a tightly guarded secret. Thankfully, Rueben Olivas has let us in on the basics. Beef short ribs depending on the number of persons 1/2 lb per person generally. 1. Mix the ingredients either by hand or in a blender. 2. Pour the marinade over your ribs in a container and coat ribs well. 3. Place the covered container in the refrigerator or cooler for at least 2 hours or over night. 4. BBQ or grill as some say, mopping the marinade on the ribs to keep them moist. 5. Because these ribs are thin, they will not take long to cook. These are juicy and delicious right off the grill. Krispie Kremes has nothing on fresh warm Buñelos Aga – banana donuts. For the best results, make with local sweet bananas. The best foods work just as well for breakfast as dessert. 2. Mix all of the other ingredients thoroughly. It’s going to look like mashed up bananas, but firmer because of the flour. The batter will be very sticky but don’t be tempted to add more flour — this is the perfect ratio to make moist donuts. Adding too much flour will make them rubbery. 3. When oil is hot, drop the mixture by spoonful into the oil, turning frequently. The Chamorro method is to scoop up a little bit of batter in your hand, then squeeze out a dollop of batter between your thumb and pointer. 4. Deep fry over medium heat. Keep your stove settings on medium heat. If the oil it too hot, it will burn on the outside before the inside cooks. Cook until golden brown. 6. Drain on a paper towel and serve warm. Some people use the same marinade for short ribs as for chicken, here Rueben Olivas shares his own sweet chili sauce. BBQ over charcoal as close to the beach as you can get. 6. If you are going to use this sauce for a barbecue glaze, cooling is not necessary. 7. Wash and allow the chicken wings to drip dry. Place chicken wings in a re-sealable plastic bag with 1 cup of the sweet chili sauce. 8. Seal the bag and rotate to make sure the wings are well coated with the sauce. Chill for at least 4 hours before barbecuing. 9. Start the fire in your BBQ pit. You want to BBQ with medium heat. This is at about 350 to 450 degrees F. Use the thermometer in the lid/cover of your BBQ pit to measure the heat. 10. If you do not have a lid thermometer, here is another way to measure your heat. Hold the palm of your hand about 5 inches above the grill. 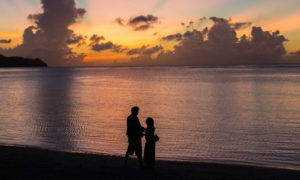 If you can hold your hand there about 5 to 7 seconds, you can consider your heat to be medium. 11. Take you wings out of the chill box and allow them to reach room temperature before BBQ-ing. This should take about 20 minutes. 12. Grease up your grill and place the chicken wings down. Barbecue your wings about 15-20 minutes per side but make sure that you constantly turn them so that the sugar from the sweet chili sauce marinade does not burn. Total cooking time should be 30 to 40 minutes. 13. The last 5 minutes of cooking, coat the wings with the remaining cup of sauce for a nice, thick glaze. 14. Serve with white rice and your favorite sides. 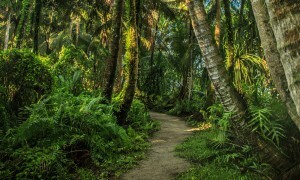 Lemmai, also called breadfruit, grows in abundance on the island of Guam. The meat can be baked as is, or made into dough for frying. The best way to eat lemmai, is slow-cooked in golfan, coconut milk, until soft. This recipe can also be used with banana, yam, or any other starchy vegetable. 1. 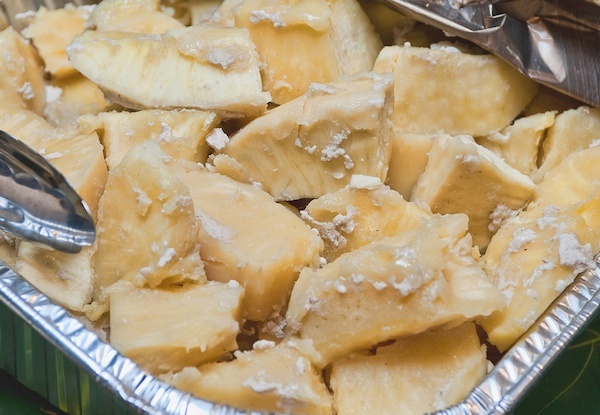 Peel the breadfruit and cut into serving-sized pieces. Place in pot large enough to fit everything, with space on top to allow for boiling the coconut milk to bubble up. 2. Mix coconut milk and salt to taste, and add sugar if desired. Pour over the vegetables, so that everything is covered, but visible. 3. Bring to a boil, then cover with a lid and drop heat to low. 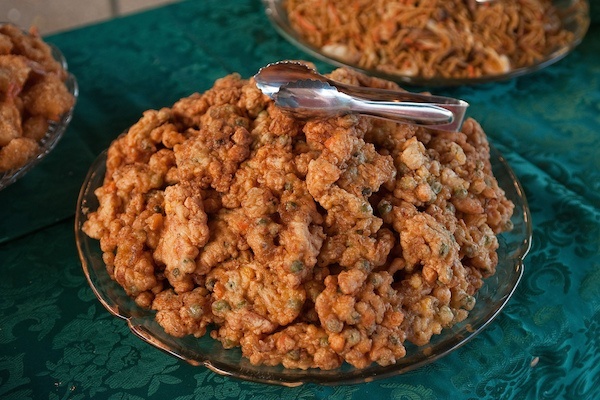 When the mixture is åppan and the vegetables firm but soft, the dish is ready to serve. Fresh roasted pork is moist and tender and should fall right off your fork. Though this recipe is as simple as it gets it takes a lot of love and patience to make the perfect hotnon babui. 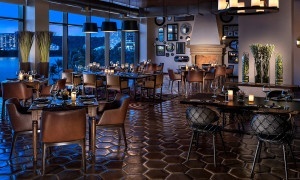 Even if made in a special oven, this dish is reserved for very special occasions. 1. 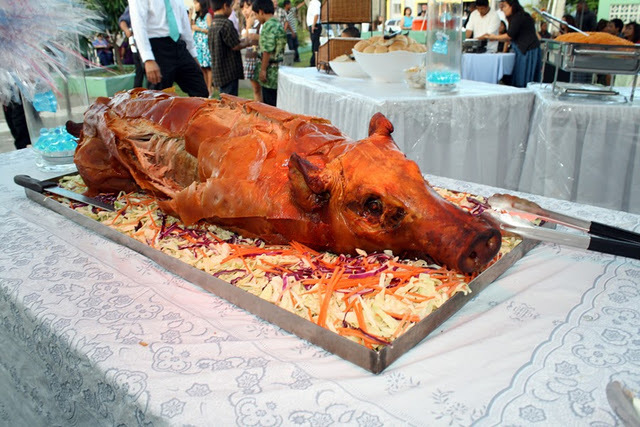 Place pig on a spit and turn. 2. Using a brush, constantly baste with water. 3. Cooking time is generally 4 hours. Some chefs recommend to allow 1 hour cooking time for every 10 pounds. 4. 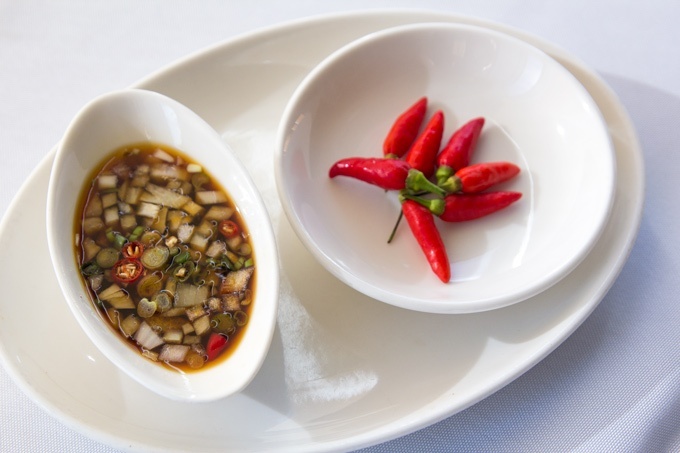 Fina’denne’ or another condiment of choice can add flavor to the meat after it is cooked. Garnish with apple, cabbage, or ingredients of your choice. The vanilla custard cake, latiya, just might be the reason why they invented desert. The island’s take on the Spanish natillas, latiya is served at the end any great celebration. 1. Bake cake as directed on box. Let cool and slice ½ inch thick. Arrange slices in a tray that has a 2-inch lip. 2. Pour milk into pot. Refill the two cans with water and pour into the pot. Add butter and sugar. Set pot on medium heat and stir occasionally. Bring to a gentle boil. 3. While waiting for the milk mixture to boil, beat the eggs and vanilla in a medium bowl. Set aside. 4. In a small bowl, mix the cornstarch and water. 5. When the milk mixture reaches a gentle boil, slowly pour in the eggs and vanilla as you quickly whisk the mixture in the pot. Ignore the shreds of eggs as this will not be evident in the final taste and texture. Stir constantly. Let this come to a gentle boil then add the cornstarch mixture. Stir and cook for two minutes. 6. Pour custard over cake and sprinkle with cinnamon. Cool uncovered in the fridge over night. 7. Slice into squares and serve chilled. What is the Philippines’ greatest export? Food! Their fried spring roll has become a staple at the Chamorro fiesta table. Since they’re small, no one looks twice when you eat five. 1. Brown the ground meat with diced onions and garlic. 2. Add 4 tablespoons Dashida seasoning, and stir. Then add beans, carrots, potatoes, and bell peppers. 3. Soak the noodles in hot water until softened. Use kitchen shears to cut into small pieces, then add to pot with the other ingredients. 4. Finally add the bean sprouts. 5. Stir all of the ingredients together, and cook until the potatoes are almost done, but still firm. Add salt and pepper to taste. 6. 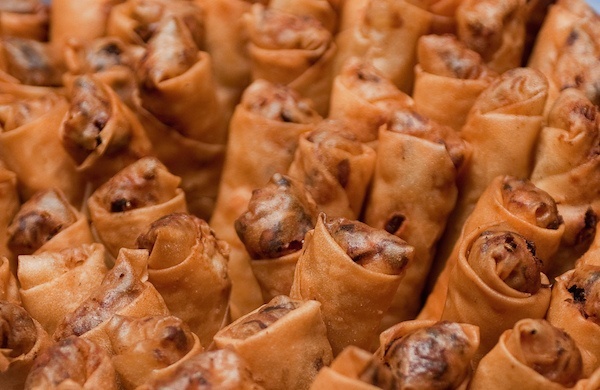 Place a lumpia wrapper on a flat surface, then add 2 to 3 tablespoons of filling on one edge. 7. Tightly fold the edge over the filling, fold the sides toward the middle, and roll, stopping one inch from the edge. 8. Moisten the edge of the wrapper with water, and press gently to seal. 9. Fry in vegetable oil until golden brown. 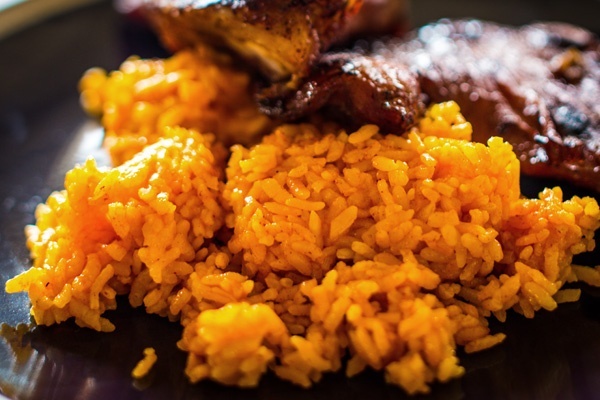 Red rice is the most iconic dish of the Mariana Islands. Rice made bright with achote is served alongside everything from BBQ to Thanksgiving turkey. Make any meal a fiesta by doctoring up your rice with this easy recipe. 1. In a medium pot, measure and rinse 5 cups of rice. Add 5 ¼ cups water (more water may be necessary while the rice cooks). 2. Add the oil, bacon drippings, and onions. Season to taste with seasoning salt, pepper, garlic powder, and salt so that it is quite flavorful. Set the pot on medium-high heat. 3. Place a strainer over the pot such that it is about 2 inches submerged into the liquid. Put the achote seeds into the strainer. As the liquid heats, the color and flavor will be released. Stir the seeds within the strainer constantly. 4. Boil the rice for 10 minutes, long enough to get a dark orange, almost red color. Stir the pot of rice occasionally to prevent the bottom from sticking and burning. 5. After the coloring is completed, remove the strainer with the seeds. At this time, if it looks like much of the water has been absorbed, add ¼ cup more water. 6. Stir rice. Cover the pot and steam for 10 minutes. 7. Check rice. If kernels are cooking and the rice looks to have enough water, scoop rice and steam another 15 minute. However, if the kernels are still quite opaque and rice looks dry, add a ½ cup more water. Do not stir cooked rice as stirring makes cooked rice mushy. 8. Check rice and repeat until rice is cooked. Use an ice cream scoop to serve perfect mounds of rice. Who doesn’t love a good fritter? Made with mixed vegetables and shrimp, make these soft dough balls a decadent part of your daily meal. This recipe is made without eggs, for a denser dough. 1. Heat the oil in a large frying pan. To test the heat, use the tip of a wooden spoon and dip it into the oil. If little bubbles start to form around the wood, then the oil is hot and ready. 2. While you’re waiting for the oil to heat up, mix all of the ingredients (except for the vegetable oil, of course) in a large bowl. 3. Drop batter by the spoonful – about 1½ tablespoons each – into the hot oil and fry until golden brown. 4. Drain on paper towels and serve warm. 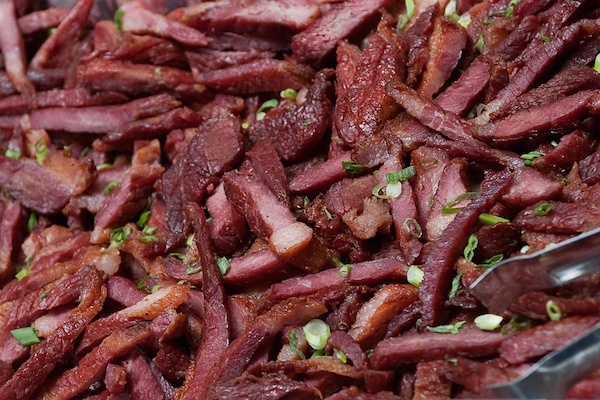 Dried cured beef, tinala’ katne takes on a bright reddish color. Smokey and salty, this fiesta staple modernizes an old preservation technique. 1. Mix ingredients and rub on meat. 2. Hang to dry or place in an oven to dry. 3. Once dried, beef can be heated over a barbecue grill or in an oven before serving. Titiyas, Chamorro for tortilla, can be made with corn or flour. They are delicious chesa on their own, or can be used like a chip to scoop up kelaguen. 1/4 to 1/2 cup cream of coconut (the sweet one, used for mixed drinks, NOT coconut cream). 1. Mix the dry ingredients together in a large mixing bowl. Add the coconut milk, melted butter, and cream of coconut (start out with 1/4 cup; increase to a total of 1/2 cup, depending on how humid your day is – more humid means less liquid). Mix together until dough forms; knead gently to form a smooth ball of dough. 2. Break off golf-ball sized pieces. Flour rolling surface and rolling pin. Roll out the piece of dough into a flat disc (about 1/8-inch thick). Place the titiyas on a dry skillet; prick all over with a fork to prevent bubbling during the cooking process. 3. Pan-fry on a dry skillet over medium-low heat for about 3 to 4 minutes on each side, or until the bottom begins to turn a golden brown; flip over and cook the other side until it turns a nice golden brown. For thicker titiyas, cook over low heat for 4 to 5 minutes on each side. 4. The titiyas are done when you gently press down on the center and it feels somewhat firm to the touch. 5. Place cooked titiyas on a plate covered with a clean kitchen towel to keep warm. Serve with chicken kelaguen. 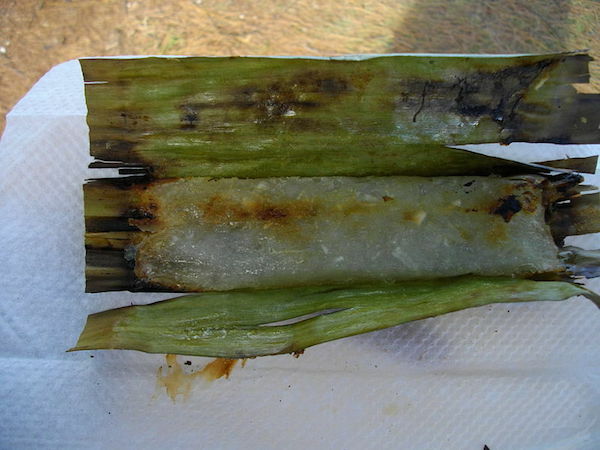 Apigige’ is a sweet mix of coconut and cassava, grilled in a banana leap. Served as a sticky snack or simple desert, apigige’ can be stored long term in the freezer. 1 16 oz. bag banana leaves, cut into 8 in. long x 5in. wide pieces. 1. Clean the banana leaves with a sponge and water. Wipe leaves with kitchen towel and set atop baking racks to dry. 2. Drain juice from coconut, saving 1 cup to set aside. 3. Finely slice the coconut. 4. 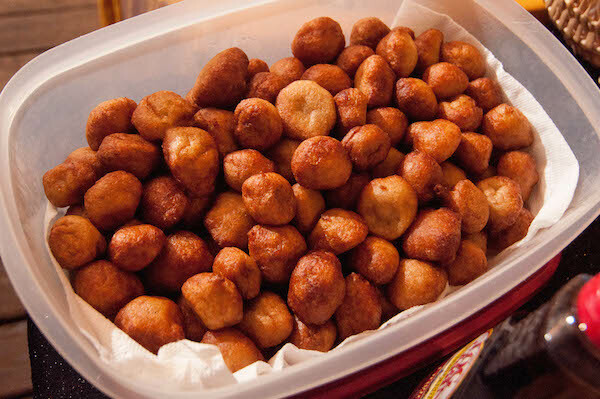 In a medium bowl, combine the coconut meat, 1 cup of juice, grated cassava, and sugar to form a thick batter. Depending on the brand of cassava, it may be quite watery. If this is the case, pour your batter into a fine-mesh colander and drain out some of the liquid. Preheat griddle or grill to medium heat. 5. Apply 2 tablespoons of mixture at the bottom edge of banana leaf, centered, about 2 inches up from the bottom. Use 3 tablespoons for thick and big apigige’. 6. Spread mix into a 4 inch x 1.5 inch rectangle, or 5 inches long if using 3 tbsp. 7. Fold and roll like a flattened burrito. 8. Cook folded-side down until apigige’ has puffed up and bottom of banana leaves are charred, about 8 minutes. 9. You will see that the apigige’ has thickened. Flip to the other side for another 8 to 10 minutes, charring as well. Marinated in an island brine of soy sauce, vinegar, and hot pepper, the Chamorro spin on the cucumber pickle is perfect alongside red rice and ribs. 1. Slice the cucumbers about 1/4 inch thick. Place the cucumber slices into a plastic colander then place the colander into a large bowl. Sprinkle salt over the cucumbers and stir to combine. Let the salted cucumber slices sit for about 15 minutes to allow excess water to drain out. After 15 minutes, pour out any water that drained into the bowl. Rinse the salt off the cucumbers and drain. 2. Place rinsed and drained cucumbers into the large bowl. Add the onion, garlic, soy sauce and vinegar. Stir to combine. 3. Let the cucumbers sit for several minutes to allow the cucumbers to soak up all of the flavors. Serve with your favorite meat dish!